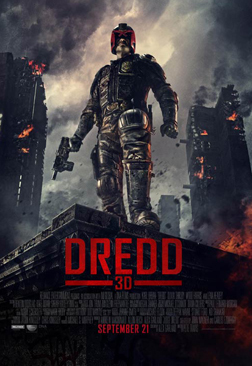 Dredd 3D is an entertaining, fun ride, that doesn't insult those who know the source material, and brings a few neat gimmicks to the B-action movie to boot. Most importantly, it washes away the bad taste that the abysmal Sylvester Stallone film left. In an autumn filled with B-action films much like any year, Dredd walks tall, its makers having had the good sense to make an entertaining film. It's all very high concept still - those familiar with the comics know of the world of Dredd: a post-nuclear-holocaust world where just Mega City-One, a sprawling urban land mass, remains. There is just one law in this sprawling crime-ridden megacity, and that is the Judge. Heavily armed policemen with impunity to serve justice on the spot, literally the judge, jury and executioner all in one. The film quickly establishes this and moves on with the story, not bothering with the Origin Story gimmick, thankfully. It's a day-in-the-life-of film, with Judge Dredd, showing rookie partner Anderson the ropes. This one, though, is one helluva day: starting off as a murder investigation and the connection to a new drug dubbed Slo-Mo, the tale ends up in Peach Trees, a massive apartment complex run by crime lord Ma-Ma Madrigal. Sooner than you can say Raid: The Redemption, she shuts down the building, and a manhunt for the two judges begins. So does a non-stop action ride that cleverly uses slow motion cameras and the confined geography to create an entertaining hour or so. It is very difficult to maintain a film with a simple plot like this without a good sense of pacing, and Pete Travis has it in spades. The movie is immaculately paced; unrelenting and without remorse, it moves forward from one brutal and cunning action sequence to the next. It is also hugely violent, which for a film like this is a major plus. The action features some really well-crafted effects, employing the slow motion effects explained as the drug's by-product and large amounts of violence to create a ballet of gore. 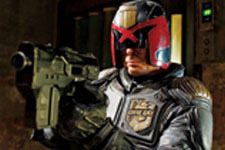 It's well supported by Karl Urban, who embodies the Judge really well. He is constantly sneering and grimacing, but often shows remarkable cunning. Selling it with the ridiculous helmet on is no mean feat, and Urban pulls it off. Olivia Thirlby as the rookie cop brings a wide-eyed vulnerability to the character, with her own ability shining through in a neat gimmick for her role. Lena Headey is the most enjoyable, though - chewing scenery as the beautiful yet scarred Ma-Ma, she is the force that unrelentingly pushes the action forward by proxy. She is having a blast while playing the cold evil of Ma-Ma, and you can see it. Dredd is ultimately a spectacle, light on thought and heavy on action, but it never feels dumb, and it never feels like the craft of filmmaking was forgotten while making it. It may be dumb fun, but it is cleverly made. One last word on the 3D - it is glorious. It's entirely unnecessary and yet employed technically superbly. Here's your couple of hours of enjoyment that the autumn films promise that never deliver - have fun. Be the first to comment on Dredd (Hindi)! Just use the simple form below. fullhyd.com has 700,000+ monthly visits. Tell Hyderabad what you feel about Dredd (Hindi)!